These are the irrepressible Ziplogs. 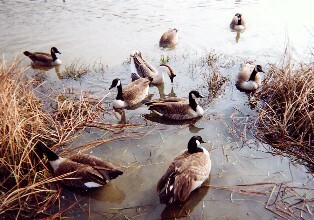 Zoey, center front, captures the wonderful exuberance of the Canada goose. 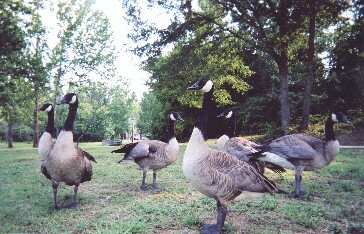 Surrounding her, from left, "Dad" (Zoey's mate), and the goslings: Horatio, Cinnamon, and Zack. Second from right is Castaway, a goose I took in under my wing last year when he arrived at the lake bruised, battered and barely able to fly. Apparently, he is related to one of the parents because he is allowed to hang with the family. 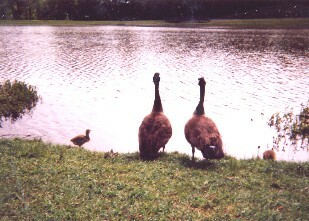 These goslings are now grown. Cinnamon found a mate from several handsome young suitors, a process I was able to observe; Horatio and Zack are "still looking." 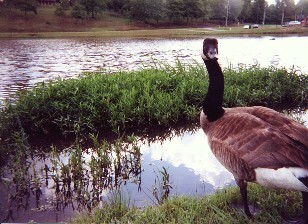 Horatio and Zack left the lake but Horatio has since reunited with his parents. He and Castaway are best friends and hang along the fringes of the new family. When I grow up ...Zoey, right, and Dad, in early evening with two of this year's goslings. Zoey wards off an intruder. 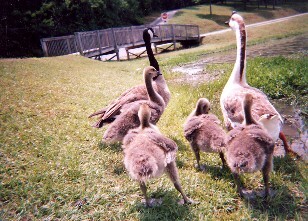 King, a brown and white swan goose, and Zoey take this year's goslings for a stroll. (Dad, Zoey's mate, is standing sentinel nearby). 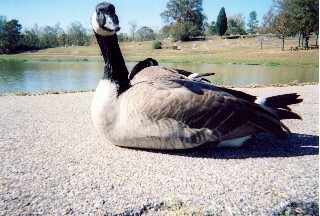 King is the lake's resident nanny. 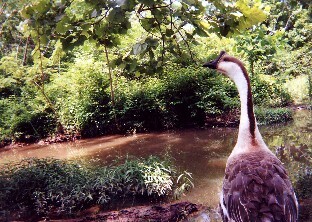 Although he hangs out mostly with Zoey and Dad, he seems to know every goose that flies in here and helps other parents care for their goslings. All nine of this year's family include the parents, the four new goslings, King, Horatio (from last year's clutch) and the Castaway. Another close-up of Zoey on a cold winter's day. A close-up of King. 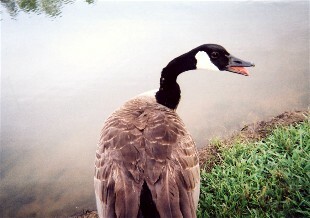 I believe swan geese are on the endangered list. No one seems to know where King came from but he certainly runs this lake.